Lots of people adore funky grocer Trader Joe's. Its vegan pad thai is apparently so delicious that it sparked a smackdown between two women in the frozen-food aisle of a Manhattan location in January. However, the activists at Change.org want to pick a much bigger fight with Trader Joe's: They're accusing the chain of wasting food. Their campaign got a kick-start from documentary filmmaker Jeremy Seifert, who recorded Trader Joe's employees trashing huge bins full of salvageable food in his film Dive! Seifert is a self-professed "Dumpster diver," and he feeds his family with the perfectly good food retailers routinely throw in the garbage. Whatever happened to "waste not, want not"? In its petition to get Trader Joe's to alter its policies, Change.org reports that Americans throw away 96 billion pounds of food every year, or 263 million pounds a day. Break it down even further, and you've got 11 million pounds of food trashed every hour, or a ton and a half each second. In a purely economic sense, waste is inefficient, and therefore bad for business. On a more emotional level, dumping food that could feed the hungry is downright sad, and certainly bad for humanity. Surely the best businesses can do much better than this. Some companies do handle surplus food better than others. For example, Panera's (PNRA) Day-End Dough-Nation program distributes unsold bakery products to local food banks and charities daily. Trader Joe's isn't the only company acting in wasteful and unsustainable ways. Seifert's campaign starts with the privately held grocer, but will move on to bigger chains with worse practices later. 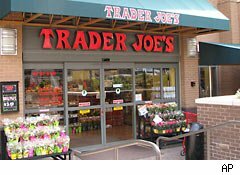 However, this isn't the first time sustainability issues have overshadowed Trader Joe's. Greenpeace targeted "Traitor Joe's" for what it considered shoddy sustainable seafood standards, prompting a pledge from the grocer to amend its fishy ways. Clearly, campaigns like Seifert's can work. And with more consumers paying increasing attention to sustainable business practices, more companies will realize that shoppers want to feel good about the stores they frequent. Motley Fool analyst Alyce Lomax does not own shares of Panera.